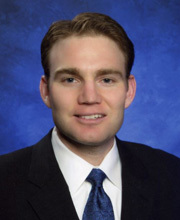 BRYAN K. JOHNSON is an attorney with the law firm of Vogt | Resnick | Sherak. Mr. Johnson assists clients in all aspects of estate planning, probate, trust administration, business and corporate law. Mr. Johnson is a member of the State Bar of California. He is also licensed to practice law in New York. Mr. Johnson’s community involvement includes serving as a current board member and former-President (2012-2014) of the Cal Poly San Luis Obispo Alumni Association’s Orange County Chapter and board member of The Elite OC, a young professional’s group. He is a former board member of the USC Alumni Club of North Orange County. Mr. Johnson obtained his Juris Doctor Degree with a Tax Law Emphasis certificate from Chapman University’s Fowler School of Law in Orange, California. While at Chapman Law, Mr. Johnson served as the Student Bar Association’s Chairman of Student Affairs. He also received a Master of Business Taxation from the Marshall School of Business at the University of Southern California where he was a member of the Dean’s List. Mr. Johnson received his Bachelor of Science Degree in Agricultural Business from the California Polytechnic State University, San Luis Obispo.